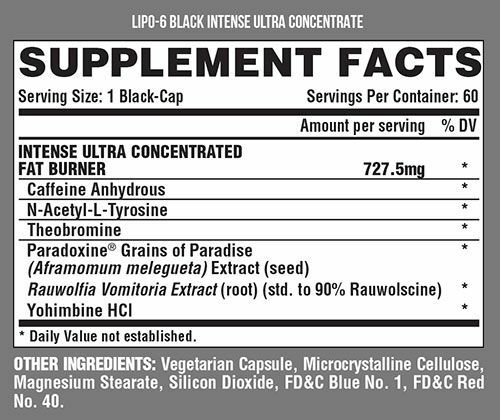 What Is Nutrex Lipo 6 Black Intense? Yohimbine HCL & Rauwolscine: Both Yohimbine HCL and Rauwolscine are very potent alpha-receptor antagonists. There mode of action is, that they can block the activity of receptors responsible for stopping fat breakdown. Consuming both compounds twice a day can significantly speed up the release of free fatty acids into the bloodstream. When taken before training or cardiovascular activity they can induce significant fat-loss beyond the point in exercise where it would normally stop. CAFFEINE ANHYDROUS: Caffeine is one of the most well-researched performance enhancement ingredients. LIPO-6 BLACK INTENSE ULTRA CONCENTRATE includes Caffeine Anhydrous. Supplementing with Caffeine immediately increases work volume and muscle strength, mental alertness and mood, assists in fat loss and helps you train at a higher intensity level. What's In Nutrex Lipo 6 Black Intense? How Do I Take Lipo 6 Black Intense? Due to the intense nature of this product all guidelines should be strictly adhered to. Take 1 Black-Cap of Lipo 6 Black Intense in the morning and 1 Black-Cap in the afternoon. NEVER EXCEED 1 BLACK-CAP PER SERVING. NEVER TAKE MORE THAN 2 SERVINGS IN A 24-HOUR PERIOD. For best results do not take with food. Consume at least 45 minutes before a meal. Do not take within 6 hours of sleep. IMPORTANT MUST READ: LIPO-6 BLACK INTENSE Ultra Concentrate is absolutely not for use by persons under the age of 18. Do not use if pregnant or nursing. Never exceed the recommended maximum dosage. Do not consume synephrine, yohimbine, caffeine or thyroid-boosting compounds from other sources, including but not limited to, coffee, tea, soda and other dietary supplements or medications containing phenylephrine or caffeine or any stimulants whatsoever. This product contains caffeine. Do not use this product for longer than 2 months. Follow with a 30 day break. Consult your physician prior to use if you are taking medication, including but not limited to, MAOI inhibitors, anti-depressants, aspirin, non-steroidal anti-inflammatory drugs or products containing phenylephrine, ephedrine, pseudoephedrine, phenylethylamine or other stimulants. Consult your physician prior to use if you have a medical condition, including but not limited to, heart, liver, kidney or thyroid disease, psychiatric disorders, difficulty urinating, diabetes, high blood pressure, cardiac arrhythmia, recurrent headaches, enlarged prostate or glaucoma. Discontinue use 2 weeks prior to surgery. Immediately discontinue if you experience rapid heartbeat, dizziness, severe headaches or shortness of breath. This product contains ingredients that may be banned by some sports organizations. KEEP OUT OF REACH OF CHILDREN. i have taken lipo 6 and i really liked it, i like too how fast was dellivered. i bought it 07/07/17 and it arived in 21 days so fast, i bought in others american stores before and i had to wait almost 3 months . We have a large selection of in-stock Nutrex products including Nutrex items and others for the lowest prices at SameDaySupplements.com® It's always easy to shop for Lipo 6 Black Intense By Nutrex, 60 Caps at SameDaySupplements.com because you can browse by reviews, brand, prices or search for specific ingredients using our search tool. In-stock orders placed before 3pm EST ship out the same day to USA, Brazil, United Kingdom, Canada, Germany, Australia, Japan, India, France and worldwide at the cheapest prices online.